Fossil fuels, especially petroleum, are still the primary energy source all over the world. With the advent of hydraulic fracturing (i.e. "fracking"), directional drilling, and other technological advances, petroleum and reservoir engineers all over the world have been able to produce much greater results, in much more difficult areas, than ever before, to meet higher global demand. "Enhanced oil recovery (EOR)" is one of the hottest and most important topics in this industry. New technologies and processes must be continually discovered and developed, even as renewable energy begins to grow and become more fruitful, as the demand for more and more energy continues to grow worldwide. 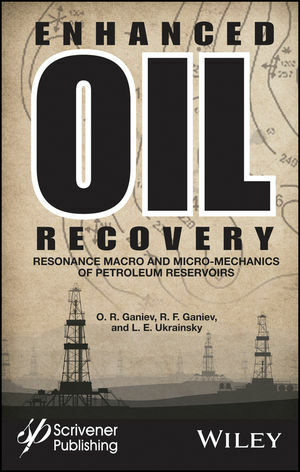 This groundbreaking and highly anticipated study discusses the scientific fundamentals of resonance macro- and micro-mechanics of petroleum reservoirs and its petroleum industry applications. It contains an overview of the research and engineering results of resonance macro- and micro-mechanics of petroleum reservoirs, which provide the scientific and applied foundations for the creation of groundbreaking wave technologies for production stimulation and enhanced oil recovery. A valuable tool for the petroleum or reservoir engineer in the field, this volume is also intended for students, teachers, scientists and practitioners who are interested in the fundamentals, development, and application of leading-edge technologies in the petroleum industry and other industrial sectors. Oleg R. Ganiev, D.Sc. (Technical Sciences), is the Chief Researcher at the Scientific Center for Nonlinear Wave Mechanics and Technology of the Russian Academy of Sciences (NWMTC RAN), a subsidiary of IMASH RAN. O. R. Ganiev is an expert in theoretical and applied mechanics, the theory of nonlinear oscillations of multiphase systems, and fluid mechanics. Rivner F. Ganiev, D.Sc. (Technical Sciences), is a Member of the Russian Academy of Sciences, Professor, the Scientific Director of the A. A. Blagonravov Institute of Machine Science of the Russian Academy of Sciences (IMASH RAN), the Director of the Scientific Center for Nonlinear Wave Mechanics and Technology of the Russian Academy of Sciences (NWMTC RAN), Head of the Department of Computational Models for Technological Processes of the Moscow Institute of Physics and Technology, Head of the Department of Applied Physics of the Moscow Aviation Institute. R. F. Ganiev is an expert in mechanics and engineering, nonlinear oscillations and wave processes, dynamics of machines and equipment, and wave technologies in various engineering applications. Leonid E. Ukrainskiy, D.Sc. (Technical Sciences) is the Deputy Director of the Scientific Center for Nonlinear Wave Mechanics and Technology of the Russian Academy of Sciences (NWMTC RAN), a subsidiary of IMASH RAN. L. E. Ukrainskiy is an expert in theoretical and applied mechanics, the theory of nonlinear oscillations of multiphase systems, and fluid mechanics.